Print is not dead. At least not yet. With the magazine aisle as crowded as it’s ever been, it takes focus from the reader to find meaningful content in the clutter. A little merchandising doesn’t hurt either! So when a title you have been known to flirt with at The Fresh Market checkout comes calling for a recipe, you answer and have the big guns ready. At The Genuine Hospitality Group big guns come in many forms, and it was Executive Chef Bradley Herron’s turn. 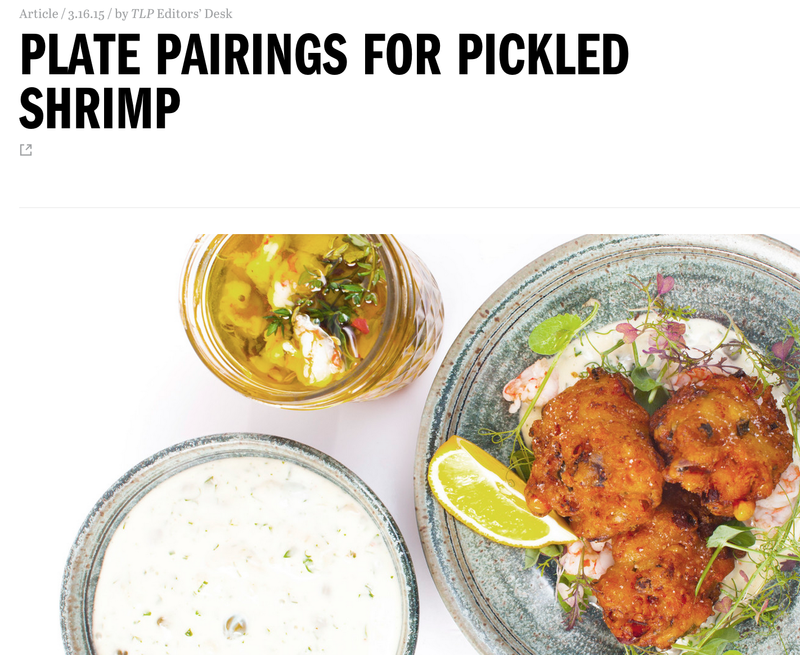 The Local Palate’s “Redux” column asks two chefs for a spin on one dish, in April’s case: pickled shrimp. Bradley answered with his pickled shrimp recipe and built a dish from it, Florida Stone Crab Fritters with Pickled Shrimp Remoulade. 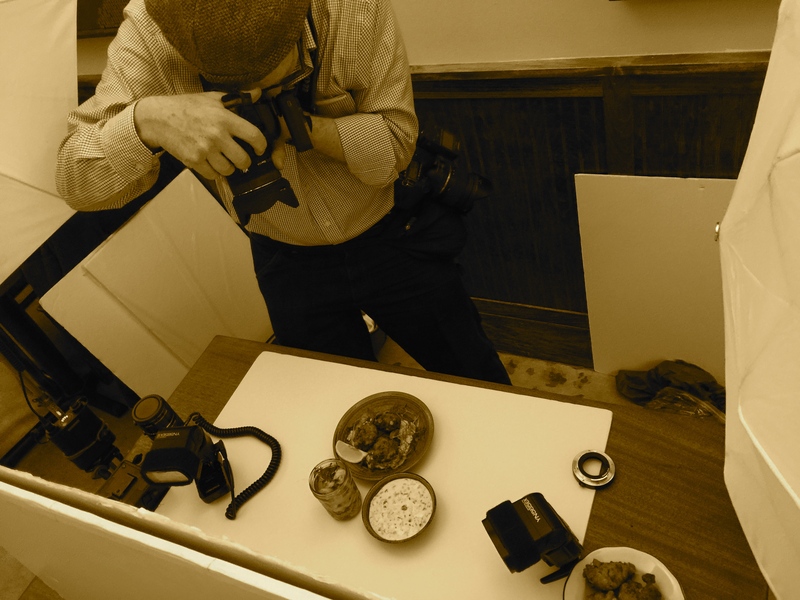 Bradley reaches for pickled shrimp when he is looking to balance a fried dish. Briny and bright, they add just the right touch of acid to complement something decadent like these golden, crabby fritters. When can you ever go wrong with double seafood? Check out this Charleston-based publication on your next shopping trip and whip up a batch. If you’re in Florida and don’t want to splurge on Stone Crab, Chef recommends any variety of locally-caught shrimp such as Key West pinks or even Royal Reds, one of our favorite local varieties with a sweet and delicate flavor. Rock shrimp are a great runner-up if you can find them! Or just make make the remoulade and serve it with your meal of the moment — pan-seared snapper with a dollop and salad sounds like dinner to me! Combine dry ingredients in a large bowl. Whisk in buttermilk until fully incorporated to make a batter, then fold in the corn, bell pepper, scallions, garlic and Stone Crab meat. Heat 3 inches of oil to 350°F in a countertop electric fryer or deep pot. If you don’t have a deep-fry thermometer, a good way to test if the oil is hot enough is to stick the end of a wooden spoon or chopstick in it. If bubbles circle around the end, then you’re good to go. Working in batches, spoon large tablespoons of batter into fryer carefully and fry until GBD – golden, brown, delicious – about 45 seconds. Remove the fritters using a spider or slotted spoon and let cool on parchment paper, seasoning immediately with salt. To serve, spread a heaping tablespoon of remoulade on the plate and arrange 3 fritters on top. Garnish with a few extra pickled shrimp. Combine all ingredients in a mixing bowl. Serve with Stone Crab Fritters. Keeps for up to 5 days sealed in the refrigerator. Fill a large pot with 3 quarts of water over high heat. Add celery, onions, bay leaves, fennel seeds, mustard seed, and salt, and bring to a boil. Drop the shrimp and cook for 30-45 seconds. Using a spider or slotted spoon, remove shrimp from the liquid, place on a paper towel-lined platter, and let sit at room temperature to cool. To make the marinade, combine olive oil, lemon juice, orange peels, ground fennel seed, chili flakes, ground allspice, fennel pollen, yellow onion, shaved fennel, bay leaves, thyme, salt, and pepper in a large mixing bowl. Gently incorporate the shrimp and pack into mason jars. Allow to pickle overnight. Keeps sealed in the refrigerator for 2-3 weeks. ← Harry’s Pizzeria Brings the BBQ Party to You!